Welcome families! Please scroll down and read the Important News section for updated information. JOIN THE 2019-2020 CRIMSON SOUND MARCHING & PEP BAND! FOR NEW AND RETURNING MEMBERS (Click here). (Fill out the attached registration form link below and mail in by June 1st). Click here to access our YouTube channel and for a video of our 2017-2018 production "Rise!" Potential New Members: please click here to view more information about the band. 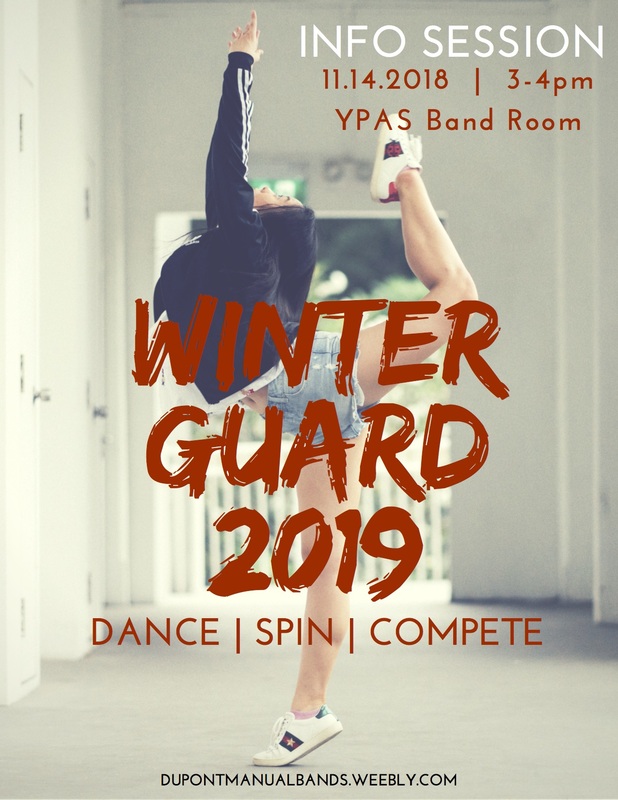 The duPont Manual Marching Band Color Guard, under the direction of Faith Bowers and Kate Adams, will be hosting a Winter Guard Interest Meeting on Wednesday, December 12th from 3-4 pm in the YPAS Band Room. This will be an independent competitive ensemble that will rehearse in a fun, positive, learning environment. Open to any 8th-11th grader and all fall guard members with interest in learning more about color guard (dance, flags, rifle, saber) while perfoming a beautifully designed custom show. For more info, please click here. Our middle school band night will take place at our "Pink Out" Game vs. PRP. on Friday, October 12th. For more information, click this link: dmmb_middle_school_band_night_2018_.pdf. Deadline to register is Wednesday, October 1oth. 8th Grade Open House will take place on Thursday, November 1st from 6-8 pm. Mr. Essig will be in the band room at YPAS and Mr. Gregory will be in the cafeteria at Manual (with the sports teams) answering questions about Manual Bands and YPAS Bands. Stop by and see either (or both) of us. Congratulations to the Crimson Sound Marching Band for earning 1st place in their class, 1st place in percussion and 1st place in color guard at the Ballard HS Invitational. The band finished 6th overall out of 15 bands. Congratulations to the Crimson Sound for making the KMEA Class 5A state semifinals "Sweet 16". Congratulations to the Crimson Sound for placing 12th in the Mid-States Band Association (KY, IN, OH) Championships out of a large field of great bands. Congratulations to the Crimson Sound for being selected to march at Walt Disney World's the Magic Kingdom Theme Park in January 2019.